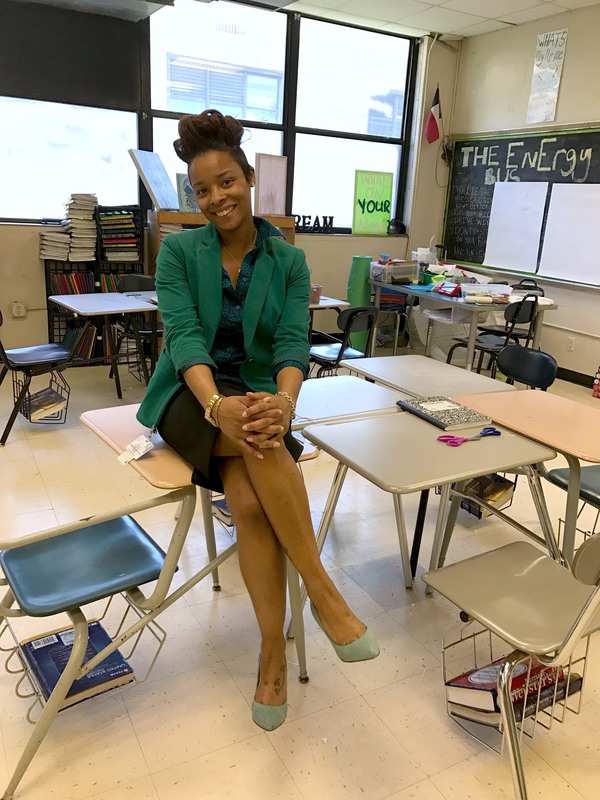 Humanities Texas is pleased to announce that Traniece Brown-Warrens, M.Ed., of Edison Middle School in Houston is one of three recipients of the 2017 Humanities Texas Award for Outstanding Early-Career Teaching. U.S. Congressman Gene Green and Todd Romero, Humanities Texas board member and associate professor of history at the University of Houston, will present Brown-Warrens with her award during a presentation at Edison Middle School on Tuesday, October 17, at 9:00 a.m.
Brown, who recently moved to Edison Middle School, taught eighth-grade U.S. history for two years at Deady Middle School. While teaching there, she also coached football and basketball and spearheaded several campus organizations, including the Young Entrepreneur’s Club, the Robotics Club and Student Council. Brown’s creative approach to fostering student interest is one of her greatest strengths as an educator. She piloted “Hip Hop History,” a course in which she teaches topics in the U.S. history curriculum through original raps written to the tune of popular hip hop songs. Brown’s approach effected tangible results: Deady Middle School’s social studies STAAR scores increased from 47% passing in 2015 to 74% passing in 2016. Brown will receive a $5,000 cash award, with an additional $500 for Deady Middle School to purchase instructional materials.